You might have noticed something special about this year’s Xfinity Birds of Prey poster. The racer on that poster – the one whose speed is blurring the image, and whose face seems to encapsulate the razor’s-edge thrill of rocketing down the course among the world’s best; the one whose image is showing up in newspaper ads, digital ads, and on all the creative imagery surrounding this year’s Xfinity Birds of Prey Audi FIS Ski World Cup – that racer is River Radamus. The image (the same one atop this article) is a photo from legendary ski photographer Jonathan Selkowitz. It was taken in 2017, when, at 19 years old, Radamus made his Audi FIS Ski World Cup debut on the Xfinity Birds of Prey giant slalom course. He missed qualifying for the second run by less than 0.2 seconds. This year, at 20, Radamus aims to take another leap forward on the world-famous course that’s only minutes from his home. A long-time Vail Valley local and top racer out of Ski and Snowboard Club Vail, Radamus is making waves in local ski racing circles – and those waves are traveling overseas as Radamus embarks on his first full year going hard at the Audi FIS Ski World Cup tour. After making his debut in Beaver Creek, River raced another Audi FIS Ski World Cup Giant Slalom in Adelboden, Switzerland on Jan. 6, 2018, then made his World Cup slalom debut in Levi, Finland on Nov. 11, 2018, but he said that coming out of the starting gate here in his home-town race is a moment unlike any other. Known for his unbeatable work ethic and mature-beyond-his-years demeanor, the 20-year-old seems to be taking his new position in the limelight well. 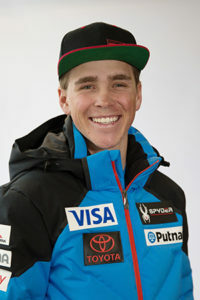 Much like Lindsey Vonn and Mikaela Shiffrin, who also came out of the Ski and Snowboard Club Vail program, Radamus seems well coached not only on the mechanics of ski racing, but also the finer points of being an upstanding young gentleman. It may have helped that his father, Aldo Radamus, was Executive Director of Ski and Snowboard Club Vail for 14 years, coinciding with his son’s matriculation. Radamus is a potential start for the Friday super G, an announcement he will confirm or deny at a press conference schedule for Thursday, Nov. 29 at 4 p.m. Radamus is also scheduled to start in the Sunday giant slalom once again. When he comes out of the starting gate, there’s little doubt a huge swell of support will erupt from the thousands of gathered fans as they watch history in the making.